Anglian: to do with people who took over the north of England after the Romans withdrew [and gave England its name! ], an Anglian king became Christian in York in 627AD. coat of arms: a badge, usually symbols on a shield, identifying a particular individual, family, city etc. corporation: the local people governing York from the early Middle Ages till around 1835 when a more democratic council took over. embrasure: the low bits of a parapet with battlements, also where a wall is hollowed out behind a window eg. to help an archer aim out of a slit window. enfilading fire: shooting a set of attackers from the side so your shots run down the line of attackers. Georgian-style: in this guide used for architecture using symmetrically placed largish windows which are mainly upright rectangles with glass divided by wood glazing bars into smaller upright rectangles, also often using pillars linked by horizontals or round arches, roofs look flat or flattish. Gothic: in this guide used for church architecture from the Middle Ages, buildings with tall, pointed arches to frame windows, doors and aisles. keep: the building in a castle which is most heavily defended. merlon: the taller bits of a parapet with battlements. musket loop: hole in a wall for a small gun to be fired through, muskets were like an early rifle but smooth bored. parapet: small wall protecting you from a fall –and from arrows etc. wall-walk: walkway high on a wall, running along the wall, usually behind a defensive parapet. 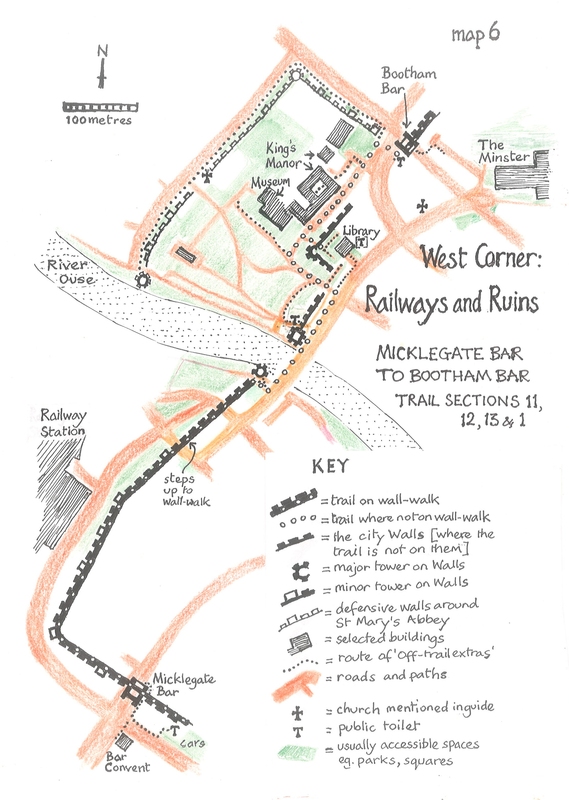 All text, map drawings, Fishergate Postern sketch, and the timeline illustrations are by Simon Mattam. David Patrick (www.davidpatrick-art.com) freely let Simon use his coloured pictures of the Walls. The descriptive titles below the pictures have beed provided by Simon. The David Patrick drawings are marked as (DP) in the captions. Sunderland Museum and Winter Gardens efficiently provided the ‘Hudson For Ever’ image and gave permission for its use. The photographs are from two main sources. Those marked with (SM) after the caption are copyright to Simon Mattam and have also been used in b&w form in his book “A Walking Guide to York’s City Walls” Those marked with (AF) after the caption are copyright to Alan Fleming who has also made a collection of his and others’ photographs of The Walls publicly available on Flickr Group www.flickr.com/groups/scenefromthewalls/pool/. This Flickr Group, which is an image archive of “Scenes from the Walls” mainly taken in early 2012, has tagged the photographs into the different walls sections to make searching easier. Individual image titles and details are not given here, but can be found as captions throughtout the Walls Trail web pages. A Friends of York Walls Flickr Group also contains photographs of “The Walls” and is publicly available at https://www.flickr.com/groups/friendsofyorkwalls/pool/ You are welcome to join the group and add your own images to this group. Friends of York Walls is a free membership organisation. 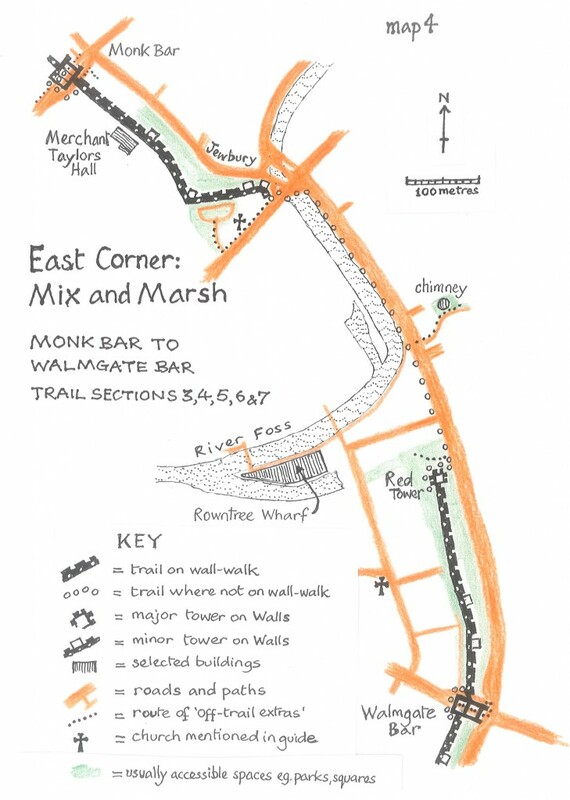 Its first chairman, Keith Myers, asked Simon Mattam to write a guide to the Walls,. The resulting text, a book and these web pages are a part of that continuing project and many members have helped. 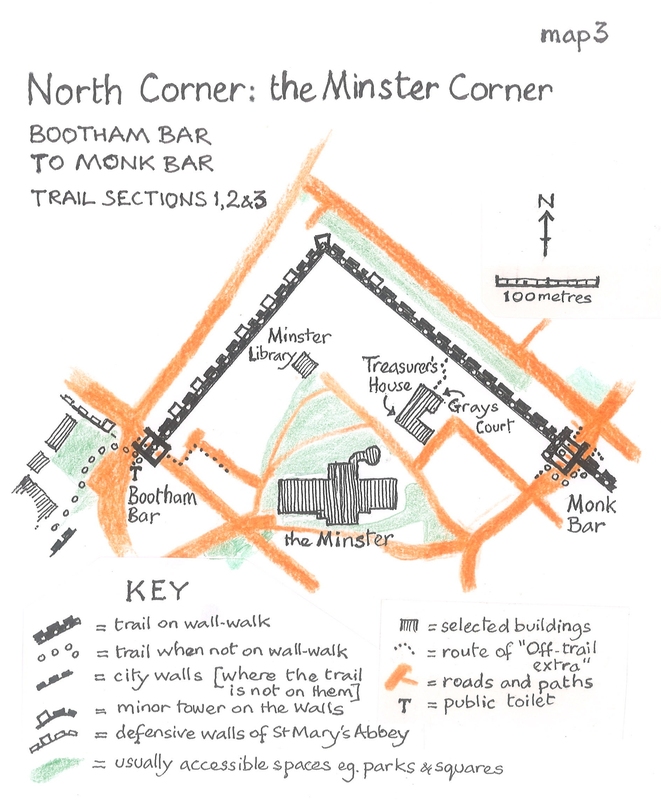 In particular Warwick Burton let Simon use what he had written for his professional York Walk guides and commented invaluably on many drafts. Alan Fleming gave useful advice and set up, with Richard Stroughair this version of the guide on the FoYW website (see FoYW website: http://yorkwalls.org.uk) and has also provided numerous photographs. More readable, with a full bibliography and many old pictures of the Walls, is Barbara Wilson and Frances Mee: “The City Walls and Castles of York –The Pictorial Evidence” (2005. 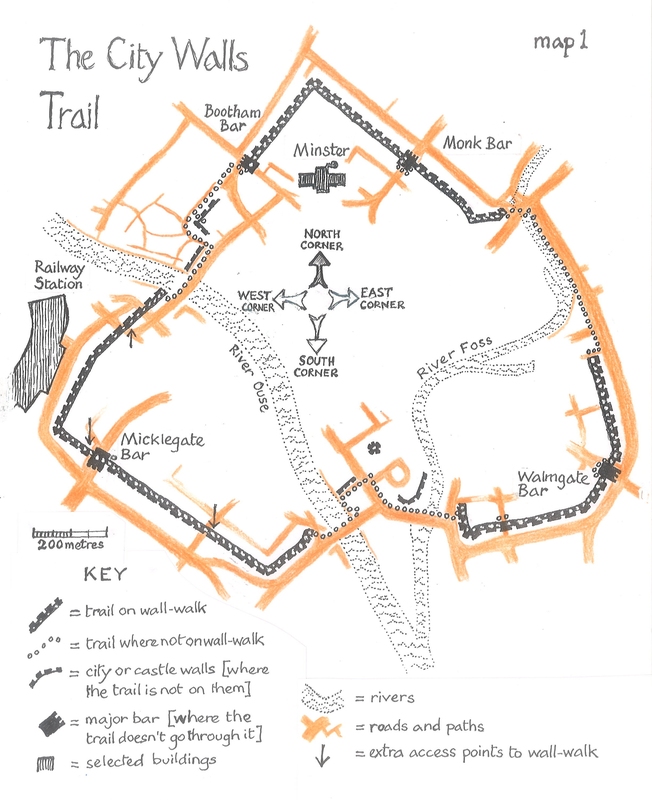 York Archaeological Trust, York). John Oxley, City of York Council archaeologist, who patiently answered many questions. The Richard III Museum [at Monk Bar but now partly rebranded], who let Simon take a photograph and use it. The Gatehouse Café [at Walmgate Bar], who let Simon take and use several photographs. Apologies go to any other contributors not specifically named here. 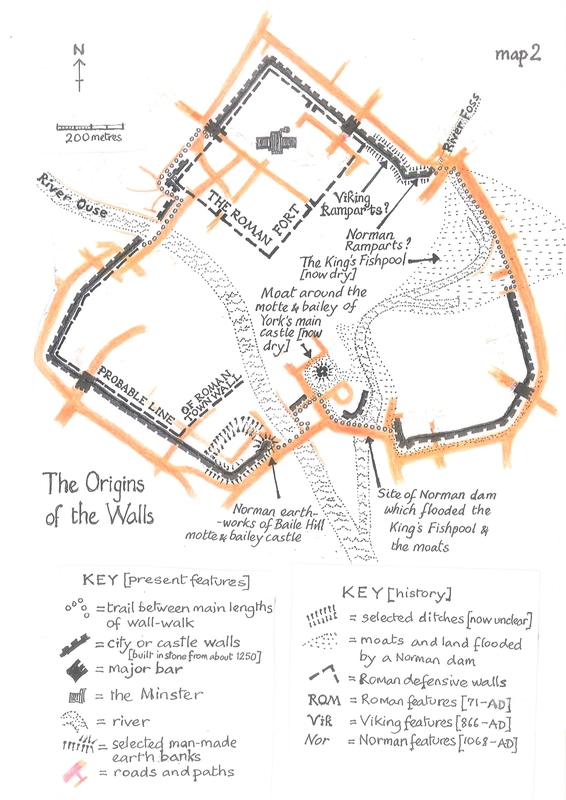 The format, layouts and overall construction of the “Walls Trail” web pages on this Friends of York Walls website have been produced by Alan Fleming – using material supplied by Simon Mattam and other acknowledged sources. Thanks also go to Richard Stroughair for help with web page construction and editing. The next phase, after checking and refining the page layout, will be to produce PDF versions of each page and trail section. All the Walls Trail web pages have been allocated QR codes. Small A6 QR cards are located at strategic places around the walls trail. These QR codes can be scanned and used by “out and about” smartphone and tablet owners to access the information around the walls. 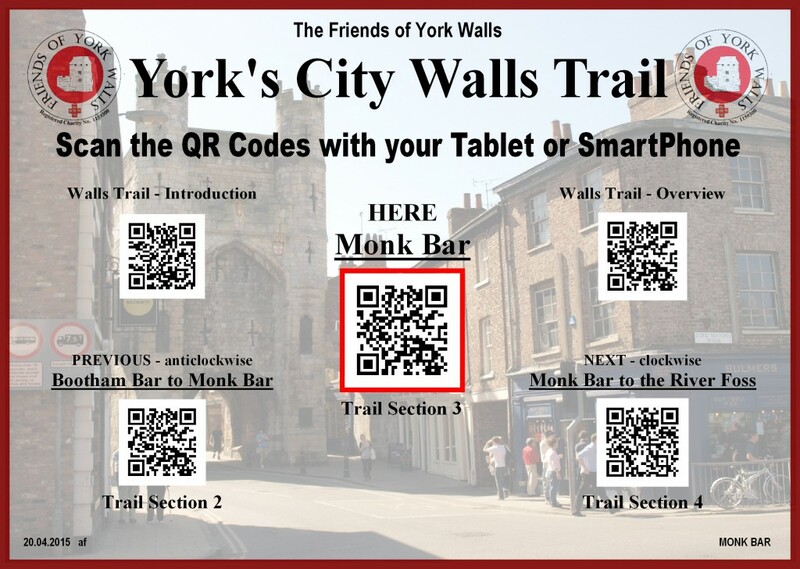 Scan the QR codes to get links to the Friends of York Walls “Wall-Trail” web pages which are relevant to the location you are at. 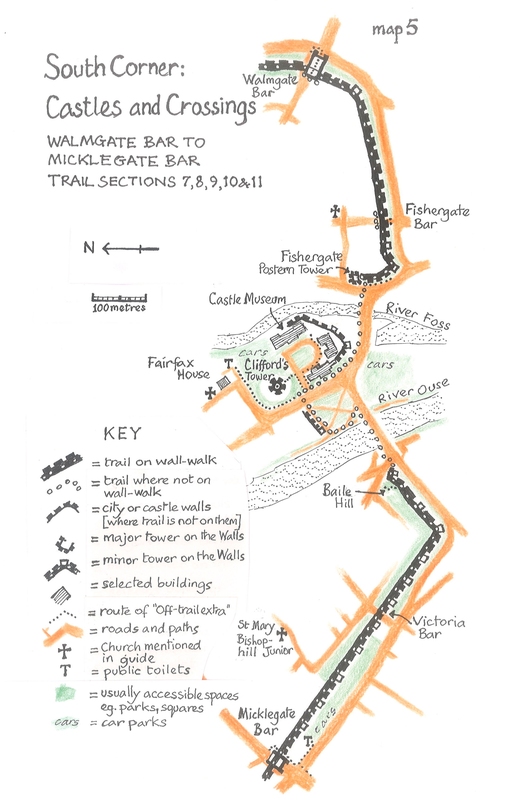 Links are provided to the on-line Wall Trail – Introduction, Overview, Here, Next and Previous trail sections, and include maps, text, and numerous pictures. If you don’t have a SmartPhone or a Tablet don’t worry -you can still buy the book “A Walking Guide to York’s City Walls” by Simon Mattam ISBN978-0-9929002-0-5. Available at bookshops, Visit York, etc., and on-line.